The SMURFS have a fake news problem! The SMURFS have a fake news problem! Stop the presses! 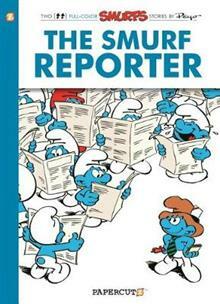 Blue Journalism is coming to the Smurfs Village. When word of mouth stories get distorted being passed along from Smurf to Smurf, Reporter Smurf is on the scene to get the scoop and report the facts! But what happens when the newspaper airs the village's dirty laundry for all to read? One reader is more than ready to believe what he sees in print...and his name is Gargamel!